The NASEM is forming a new committee to develop a research agenda and research governance approaches for climate intervention strategies that reflect sunlight to cool Earth. In the quest to mitigate the buildup of greenhouse gases in Earth’s atmosphere, researchers and policymakers have increasingly turned their attention to techniques for capturing greenhouse gases such as carbon dioxide and methane. Once captured, these gases can be stored or put to use. This new publication summarizes a workshop that explored the potential for relatively permanent storage of carbon in the Earth’s geologic formations. This new publication summarizes a webinar and workshop that addressed the state of knowledge and research needs related to the potential of bio-energy with carbon capture and storage as a carbon dioxide removal approach. Direct air capture (DAC) refers to a range of technologies that capture carbon dioxide (CO2) from ambient air. Although terrestrial carbon sequestration regularly occurs in nature, there are human actions that can help maintain and enhance the carbon sequestration capacity of land—and help mitigate the effects of climate change. This report summarizes the current state of understanding of methane emission sources and the measurement approaches and evaluates opportunities for methodological and inventory development improvements. This report evaluates the draft Fourth National Climate Assessment (NCA4) report to determine if it meets the requirements of the federal mandate, whether it provides accurate information grounded in the scientific literature, and whether it effectively communicates climate science, impacts, and responses for general audiences including the public, decision makers, and other stakeholders. This report provides an independent critique of the draft second State of the Climate Cycle Report, which aims to elucidate the fundamental physical, chemical, and biological aspects of the carbon cycle and to discuss the challenges of accounting for all major carbon stocks and flows for the North American continent. The National Academies of Sciences, Engineering, and Medicine has developed a new infographic on the connection between extreme weather events and climate change that is based on the report Attribution of Extreme Weather Events in the Context of Climate Change. The National Academies are establishing a new Climate Communications Initiative to coordinate efforts across the institution to facilitate rapid and effective communication of evidence-based insights to an attentive public and critical decision makers. How did climate change affect that extreme weather event? Watch this short animated video from the National Academies explain how the science of extreme weather event attribution is like baking cookies. NEW REPORT: Negative Emissions Technologies and Reliable Sequestration: A Research AgendaNEW STUDY: Developing a Research Agenda and Research Governance Approaches for Climate Intervention Strategies that Reflect Sunlight to Cool EarthGaseous Carbon Waste Streams Utilization Status and Research NeedsGeologic Capture and Sequestration of Carbon: Proceedings of a Workshop—in BriefBioenergy with Carbon Capture and Storage Approaches for Carbon Dioxide Removal and Reliable Sequestration: Proceedings of a Workshop—in BriefDirect Air Capture and Mineral Carbonation Approaches for Carbon Dioxide Removal and Reliable Sequestration: Proceedings of a Workshop—in BriefLand Management Practices for Carbon Dioxide Removal and Reliable Sequestration: Proceedings of a Workshop—in BriefImproving Characterization of Anthropogenic Methane Emissions in the United StatesReview of the Draft Fourth National Climate AssessmentReview of the Draft Second State of the Carbon Cycle Report (SOCCR2)Extreme Weather: What’s climate change got to do with it?Climate Communications InitiativeHow did climate change affect that extreme weather event? There are well-understood physical mechanisms by which changes in the amounts of greenhouse gases cause climate changes. 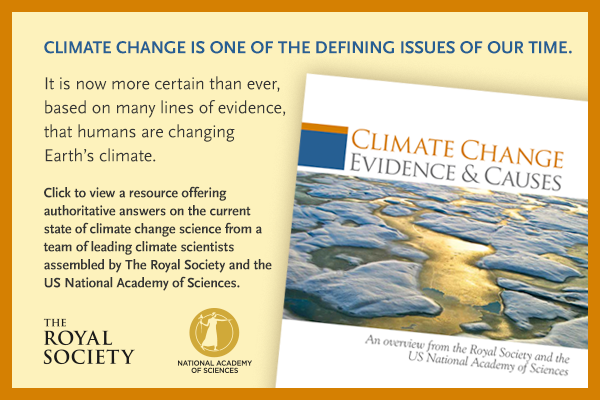 The US National Academy of Sciences and The Royal Society produced a booklet, Climate Change: Evidence and Causes (download here), intended to be a brief, readable reference document for decision makers, policy makers, educators, and other individuals seeking authoritative information on the some of the questions that continue to be asked. The booklet discusses the evidence that the concentrations of greenhouse gases in the atmosphere have increased and are still increasing rapidly, that climate change is occurring, and that most of the recent change is almost certainly due to emissions of greenhouse gases caused by human activities. Further climate change is inevitable; if emissions of greenhouse gases continue unabated, future changes will substantially exceed those that have occurred so far. There remains a range of estimates of the magnitude and regional expression of future change, but increases in the extremes of climate that can adversely affect natural ecosystems and human activities and infrastructure are expected.